The TAG Heuer Formula One Women’s Watch WAH1211BA0861 is certainly one of the more appealing ladies timepieces from this maker. This model offers sporty TAG Heuer appearance, with a touch of feminine style. The TAG Heuer Formula One Women’s Watch WAH1211BA0861 might make a TAG Heuer convert out of me yet. While the look is modern and contemporary, and the materials of the highest quality…this watch is still a TAG. 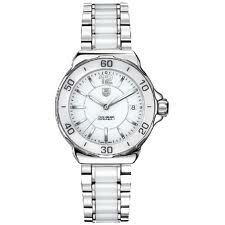 For me, TAG Heuer has always been just a bit too masculine, even their most feminine models, but the TAG Heuer Formula One Women’s Watch WAH1211BA0861 has just enough estrogen to keep me interested. The stainless-steel case houses a white dial with a scratch resistant Sapphire crystal. This Formula 1 is Swiss quartz run, which will keep the price down and make it quite accurate and reliable. This watch features a date aperture as one of its accents and luminescent hands for easier reading. The TAG Heuer Formula One Women’s Watch WAH1211BA0861 has one feature that I simply love…the steel and white ceramic bracelet. This addition makes the look of the watch come to life. The snow white coloration, matched with the shiny steel turns this watch into a fresh and young creation. The TAG Heuer Formula One Women’s Watch WAH1211BA0861 retails for just over $1,000 and is available at authorized TAG Heuer dealers.